Thames and Kosmos have a range of products called Kids First specifically designed with preschool age (3-5 year olds) in mind. This range focuses on developing STEM skills through storytelling, construction, and hands-on experimentation. 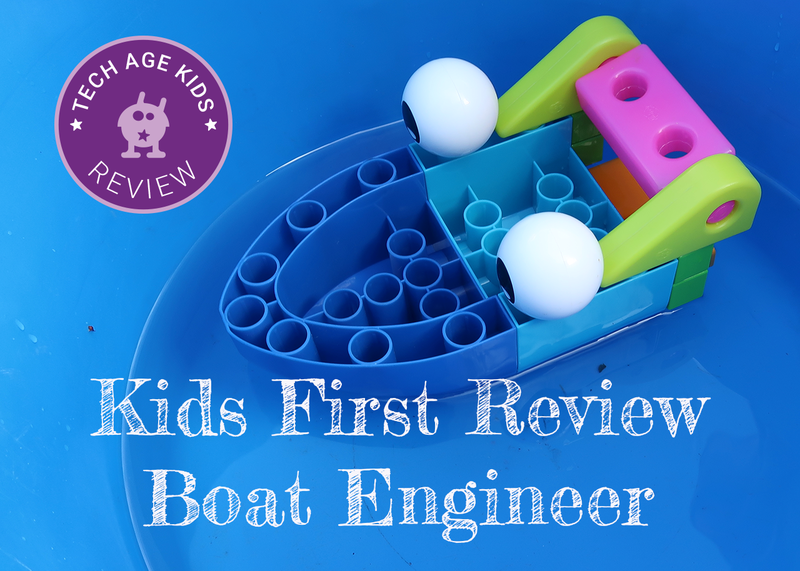 We got a Boat Engineer set in the summer and reviewed it with my 6-year-old and a friend’s 3-year-old. Disclaimer: Thames and Kosmos sent us a kit to review. Our views are always honest and our own. Most of the Thames and Kosmos Kids First range focus on engineering/construction skills but there are also three kits covering the topic of Science (Laboratory, Human Body, and Botany). 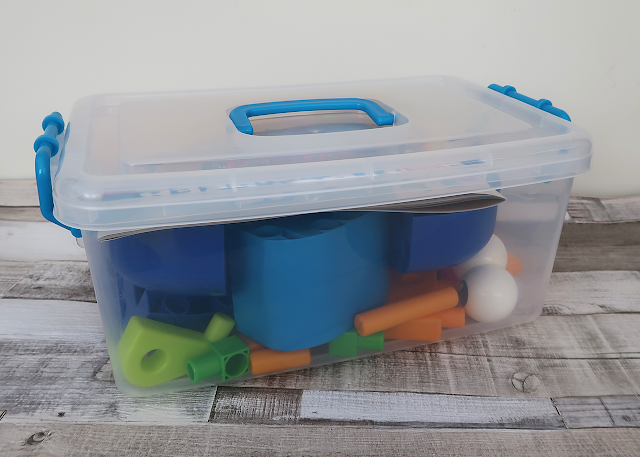 The Aircraft, Automobile, Amusement Park, Robot and Boat Engineer kits all come in great plastic storage boxes and if you have more than one set you could combine them eventually for free play. The kit comes with 52 construction pieces (they are different to LEGO-type blocks), a storybook and a durable plastic storage box. Everything you need to play, learn and store things away - we like it! We love the fact that the construction pieces are brightly coloured and there’s not a sign of dominant blue/pink colours - nothing that says this is for boys! In fact, the main characters in the story are a brother and sister, Ty and Karlie Omega. There are many toys that use a story to teach STEM concepts. The likes of Goldie Blox, and Cubetto use a similar approach. Sometimes children just want to get on with the building and read the story later. In the Boat Engineer kit, the story walks you through different problems that the characters need to solve. Reading the story and doing the construction as you follow on their adventure introduces the child to a more complex build every time. I love that each boat has a name and a different function - Kimmy the canoe, Frannie the fire rescue boat and Humboldt the hydroplane - to name just a few. The story also gives information about 10 different types of boat, making it a great learning resource. The instructions to build the models are intertwined in the story. They are clearly labeled so if your child doesn’t want to read the story and just want to build a boat, they can. The instructions are fairly clear and my 6-year-old had no trouble following them. He helped his younger friend to build his own boat. The construction pieces are blocks and dowels and not LEGO-type bricks. They feel robust and most are easy to build. I found the short dowels were trickier for the 3-year old to peg in place or pull out, as they don’t have any grip. We used the end of a wooden spoon to push them out from the other side. We also couldn’t get the longer dowel to push through blocks, but my son came up with an alternative design which worked perfectly well. Some problem-solving skills right there! Unfortunately, you have to break up a previous model to make the next boat. My kids always want to keep the things they've made, so this was a hard lesson to learn. Rather than rushing through the story, I allowed my son to enjoy playing with the boat he just made and when he was ready we built the next one. This took days sometimes! 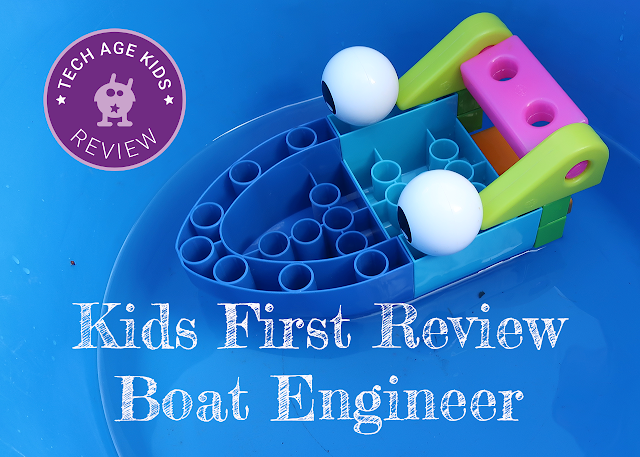 The fact that it’s a boat engineering kit, means your kids probably would want to test the buoyancy of their models. I got a large bucket of water and a shallower tray to let the kids play freely, testing whether their boats floated. 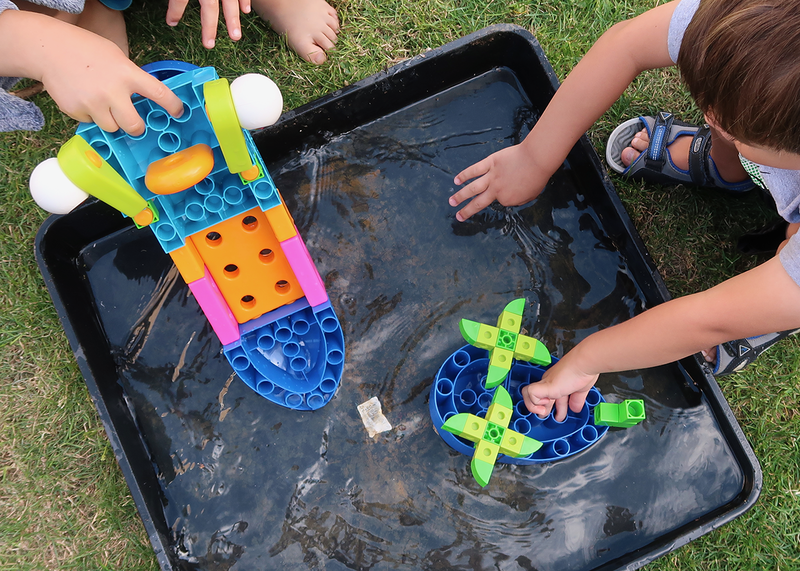 The boats float well and the kit lends itself nicely to outdoor water play. Some kids would just want to build their own things. There’s enough pieces in the kit to get a bit creative. Two kids should also be able to make a boat each, for races of course! 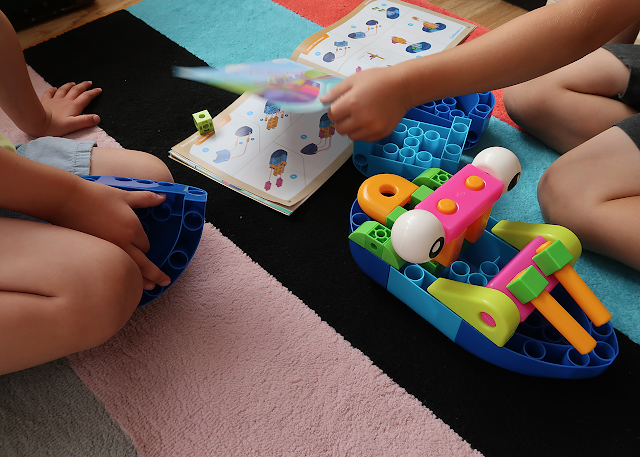 I really liked the Boat Engineer Kit because it would appeal to girls and boys, and uses a story to teach engineering skills. The content in the kit is not babyish and a child will learn a lot about boats. Learn more about the kit and view a sample of the storybook.